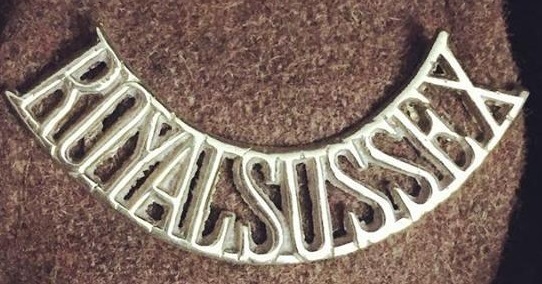 The Royal Sussex's 2nd battalion is the primary interpretation for our World War One work. 2nd Battalion, The Royal Sussex Regiment, went over to France with the first wave of men in the summer of 1914. We focus predominantly on 1914-1916, or when the regiment arrived, up to the Battle of the Somme. Below you will find a basic guideline for a Royal Sussex soldier of that time. All new recruits into the recreated 2nd Battalion, The Royal Sussex Regiment, begin as privates. Service Dress Cap - with bi-metal Royal Sussex cap badge. "Greyback" Flannel Shirt - grey flannel, Victorian style, band collar of white cotton or ticking. Under Shirt - neutral color, natural material. 1902 Pattern Service Dress Tunic - khaki serge tunic with sewn-on shoulder straps bearing brass regimental titles [pic]. The tunic has four pockets on the outside, the chest pockets having pleats while the lower pockets only having flaps visible. A durable, practical, hard-wearing jacket closed in the front by five brass King's Crown General Service buttons. 1902 Service Dress Trousers - khaki serge wool. Wool Socks - grey, off white, khaki, neutral colors. Ammunition Boots (B5) - no toe caps, polished black. Largely the same as the Victorian ammo boots. (Optional) Field Service Cap - 1890's Boer War style dark blue (early war) or Edwardian khaki serge with bi-metal Royal Sussex cap badge. (Optional) 1915 Winter Cap - "Gor'Blimey" Service Dress cap. (Optional) 1916 Trench Cap - soft, khaki serge often worn in lieu of the rigid Service Dress Cap. (Optional) Waterproof Cap Cover - designed to protect the Service Dress Cap from the rain. (Optional) Jerkin - brown leather sleeveless waistcoat with button closures. (Optional) 1902 Pattern Greatcoat - khaki serge wool, single breasted with stand and fall collar. (Optional) Cardigan/Sweater/Waistcoat - private purchase, wool, knitted, neutral colors to period style. Identification Discs - privately made ones very common, later two pressed-fiber discs were worn around the neck with his name, religion (CE, RC, etc. ), and serial number. (For front line service late-1915 and on) Helmet, Steel, Mk. I - has a thick felt pad inside and a leather liner with a leather chin strap. The liner is attached to the helmet by means of a rivet through the center of the top of the helmet itself. Should be painted a dark green/brown. Gas Protection Equipment - examples include gas goggles & black veil respirator (1915), Hypo Helmet (1915), PH Helmet (1915), and the Small Box Respirator (1916). The PH Helmet was often worn even after the SBR had been introduced as a back-up. P1908 Webbing Equipment - a self-contained gear carrying system. The P08 webbing integrated a broad waist belt, left and right ammunition pouches, water bottle carriage, shoulder braces, Intrenching tool head carrier, bayonet frog, haversack, and Large Pack. The P08 also incorporated the D-style mess tin with a khaki cover. The khaki P08 gear was treated with "Blanco" making it a particular shade of green. Carries a total of 150 rounds. Blanco - green colored protector applied to the canvas web equipment. Originally came in round "cakes". Bandolier - cloth carriers for an additional 50 rounds each. Short Magazine Lee-Enfield (No. 1, Mk. III or Mk. III*) - the primary service rifle of the British army at this time, .303 caliber bolt action. P1907 Mk. I Bayonet - bayonet designed for the SMLE, the early 1907s had a quillon on the guard, but most were just straight guards. Personal Effects - to be kept in the Large Pack, may include a fork, knife, spoon, hygienic equipment such as comb, razor, shaving brush, toothbrush, small mirror, etc. Family photos and other small comforting items encouraged. Officers were responsible for providing their own uniforms. As a result, an infinite number of variations were possible. Different tailors had access to slightly different color materials, some had details others did not, and as such, no two officers were exactly the same. And that was not a problem. What follows here is just a general guideline for what an officer might have, but not necessarily binding any officers to exactly what is laid out here. Service Dress Cap - similar in style to O/Rs, made of superior material such as barathea. Bronze regimental cap badge. Shirt - typically cotton, either khaki, tan, or shade of green. Worn with a tie. Under Shirt - neutral, natural material. Service Dress Tunic - open-collared jacket with chest pockets and lower pockets, closed with regimental, GS, or leather buttons. Rank was worn on the cuffs, though some battalions began wearing them on the shoulder straps. Bronze regimental badges worn on the lapels. Trousers - trousers or breeches were commonly worn with tall boots or with low boots and puttees. Puttees - if worn with low boots, khaki or tan wool. Boots - private purchase. Typically brown leather. (Optional) Field Service Cap - early war dark blue or khaki serge with Royal Sussex cap badge. (Optional) Trench Cap - soft, khaki or green serge often worn in lieu of the rigid Service Dress Cap. (Optional) Greatcoat - khaki or green wool, double-breasted with stand and fall collar. Trenchcoats were popular as well. Identification Discs - either privately made or two-disc pressed fiber version. (For front line service late-1915 and on) Helmet, Steel, Mk. I - same as O/Rs, though sometimes officers had superior quality liners. Gas Protection Equipment - as O/Rs'. Sam Browne Equipment - officially consisted of waistbelt, shoulder strap(s), pistol holster, and ammunition pouch. Numerous private-purchase accessories for Sam Browne equipment existed at the officer's discretion. Pistol - typically a .455 caliber Webley Mk. IV, V, or VI service revolver. Since officers purchased their own weapons, it could be something else. Sword - P1897 Infantry Officer Sword, mounted in a brown leather scabbard on the Sam Browne belt. Totally impractical for WWI combat and almost never worn. 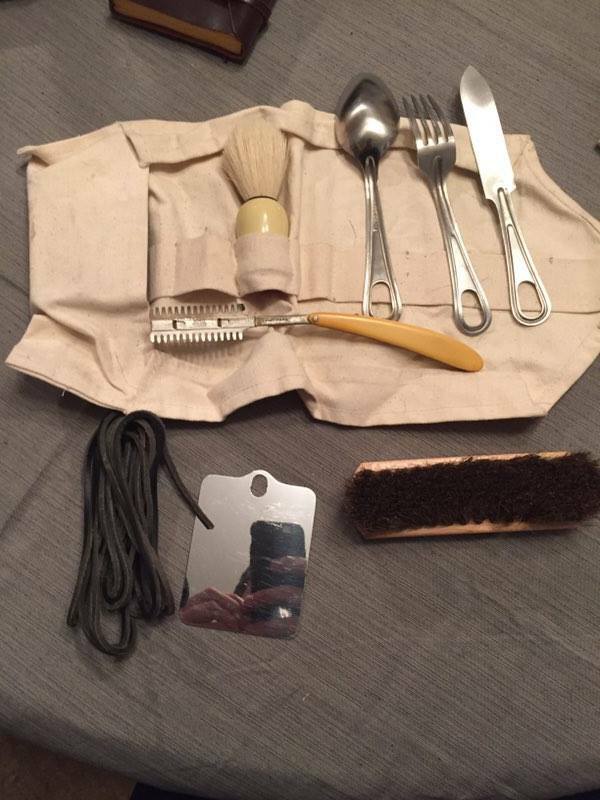 Personal Effects - to be kept in the satchel Pack, may include a fork, knife, spoon, hygienic equipment such as comb, razor, shaving brush, toothbrush, small mirror, etc. Family photos and other small comforting items encouraged. Note: as the war progressed, officers often adopted Other Ranks equipment to appear less conspicuous in combat environments.